yet there isn't a train I wouldn't take, no matter where it's going"
Typically, SIERRA HOTEL Railway Inc. enters into an agreement with Amtrak® to pull the car on an Amtrak® train. Our operation is independent of Amtrak®, whose responsibility is limited to hauling the car. The Sierra Hotel can travel most anywhere on Amtrak with the exception of places where height restrictions apply (Boston, New York City, Philadelphia). Some favorite destinations and itineraries are: through the Rocky Mountains via Colorado or Montana, along the West Coast from Los Angeles or Oakland to Portland or Seattle, along Lake Champlain and the Adirondacks to Montreal, or traversing the Appalachians from Chicago to Washington, DC. We will work with you to plan your personal itinerary within the Amtrak system, or in special circumstances off Amtrak routes. See below for popular journeys and destinations. Chicago is usually the beginning or end of a rail journey on the Sierra Hotel. Shorter one or two-day trips may also be available out of Chicago for Pontiac or Grand Rapids, MI, St. Louis & Kansas City, MO, St. Paul, MN and Quincy, IL. Staying aboard the car in Chicago is possible with advance notice, but requires extra switching charges. St. Louis, MO and New Orleans, LA are easy destinations from Chicago. Stay aboard at historic St. Louis Union Station, or in New Orleans just a short distance from Canal Street and the French Quarter. Destinations available on The California Zephyr include Chicago, IL, Omaha, NE, Denver, CO, and Emeryville (Oakland/San Francisco), CA*. This is our most popular route and includes the Colorado Rockies, Utah, the Sierra Nevada and San Francisco Bay. Chicago, IL, Kansas City, MO, Albuquerque, NM, Los Angeles & San Diego, CA are accessible via the Southwest Chief. Highlights include Raton Pass and the mountains of New Mexico. 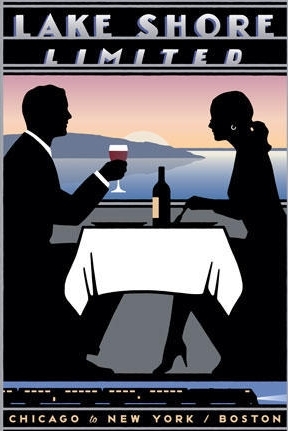 The Empire Builder itineraries can include Chicago, IL, St. Paul, MN, Whitefish, MT (Glacier Nat. Park), Spokane, WA, Portland, OR, and Seattle, WA. Included in the scenery are the Mississippi River, Glacier Park, the Cascades, the Columbia River and Puget Sound. 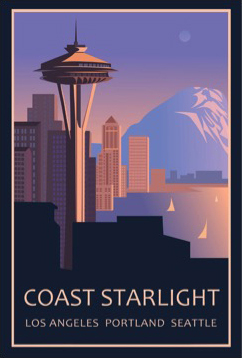 The Coast Starlight accesses Los Angeles & Oakland, CA*, Portland, OR, and Seattle, WA. Outstanding views prevail along this route from the southern California coast to San Francisco Bay and on to Mt. Shasta, the southern Cascades and Puget Sound. The Texas Eagle travels from Chicago, IL to St. Louis, MO, Dallas/Ft. Worth and San Antonio, TX. The Sunset follows the southern route between New Orleans, LA, Houston & San Antonio, TX and Los Angeles, CA. *Passengers may not stay aboard in Oakland/Emeryville, CA. Please click on the posters below to view the full Amtrak route information. Some highlights among the eastern trains are the Great Lakes, Hudson River and Berkshire Mountains on the Lake Shore Ltd., the mountains of West Virginia on the Capitol Ltd., and especially on the Cardinal, and along Lake Champlain on the Adirondack. Destinations served by the Capitol Ltd. are Chicago, IL, Pittsburgh, PA, and Washington, DC. The Lake Shore Ltd. accesses Albany, NY, Montreal, Quebec (via The Adirondack) and Washington, DC. The Cardinal serves Washington, DC, Indianapolis, IN, and Chicago, IL. The Palmetto goes from Washington, DC to Savannah, GA, while the Silver Star and Silver Meteor serve Washington, Jacksonville, Tampa and Miami. The Crescent travels from Washington, D.C. to New Orleans, LA.